This set of Environmental Engineering Multiple Choice Questions & Answers (MCQs) focuses on “Conventional Trickling Filter”. Explanation: The breaking of the biomass from the slime layer in conventional filter is called sloughing. It makes the effluent turbid. Explanation: The minimum hydraulic loading of percolating filter is 1m3/m2/day whereas, the maximum hydraulic loading of percolating filter is 4m3/m2/day. 3. Which of the following is called as a conventional trickling filter? Explanation: Low rate trickling filter is called as a conventional trickling filter. It is also called as standard rate and percolating filter. Explanation: The BOD of the effluent obtained after the filtration of sewage from the low rate trickling filter is between 80 to 90% and the effluent obtained is highly nitrified and stabilized. Explanation: The efficiency of a percolating filter is given by η = 100/(1+0.0044 (μ)1/2) where, μ is the organic loading in kg per hectare meter per day. The removal of BOD is independent of the loading conditions in infiltration process. Explanation: When the loading conditions are less, the efficiency of the filter will be more and the removal of BOD from the effluent will be more. 7. The organic loading in low rate trickling filter is 900 kg/hectare-meter/day. What is the efficiency of the filter? Explanation: Efficiency of low rate trickling filter = 100/(1+0.0044 (μ)1/2) = 100/(1+0.0044 (900)1/2) = 100/1.132 = 88.3. Explanation: The organic loading in a trickling filter is measured in kg / hectare-meter/day where, 1 hectare = 104m3. Explanation: The hydrogen sulfide gas is formed when the fixed nozzles are used during the filtration process, so sewage is chlorinated to prevent the formation of H2S gas. Explanation: The recirculation factor F = (1+ R/I) / (1+0.1 (R/I)) 2 = (1+0) /(1+0)2 = 1. 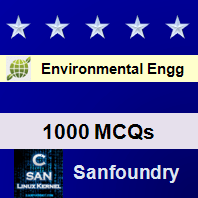 Sanfoundry Global Education & Learning Series – Environmental Engineering .